Sterling, Colorado was incorporated in 1884 and became the county seat of Logan County in 1887. 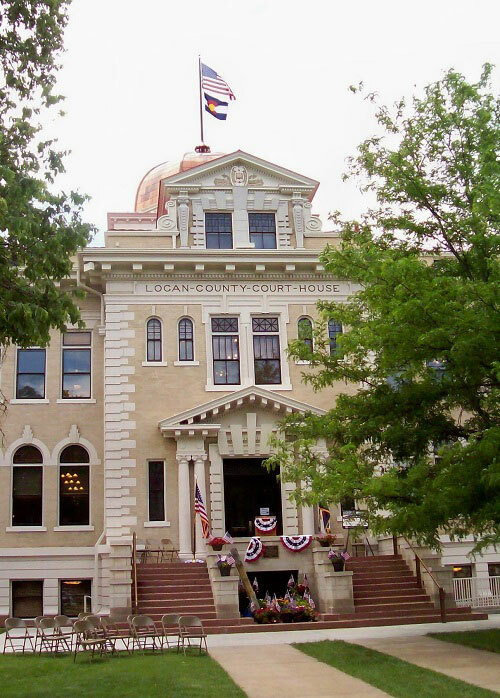 Logan County was formed by an act of the Colorado State Legislature on February 25, 1887. 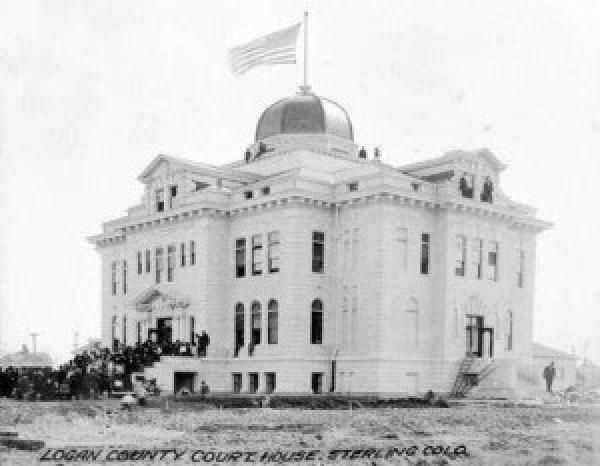 The County was formerly a part of Weld County and citizens from the eastern part of the state were required to travel to Greeley, the county seat to conduct official business. Citizens petitioned the state legislature to form the new county. Later on, Phillips and Sedgwick Counties were created from the original Logan County. Serving on the first Board of County Commissioners for Logan County were: Henry Schneider, D. B. Morgan and Jacob Furry. Governor Alba B. Adams appointed the men and also appointed W. S. Hadfield several months later to fill a vacancy created by the death of Commissioner Furry. Other officials appointed to oversee the new Logan County were W. F. Kiester, Clerk and Recorder; M. H. Smith, Treasurer; H. T. Sutherland, County Assessor; John Tobin, Sheriff; T. L. Watson, County Judge; Dr. David Beach, Coroner; J. J. Cheairs, Surveyor; and Oscar Trego, County Superintendent of Schools. 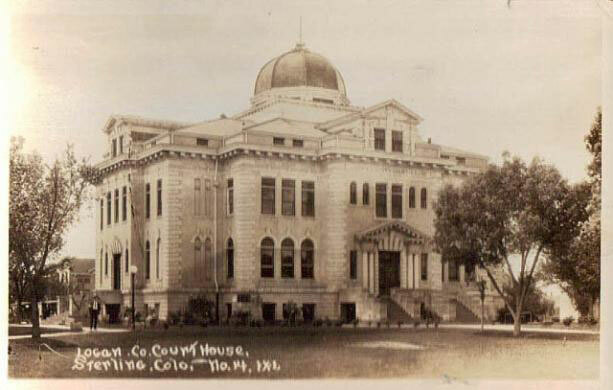 In 1908 J. J. Huddart of Denver was retained as architect to complete consruction drawings and specifications for a new Courthouse. Mr. Huddart was educated in England, had an established architecural practice in Denver, Colorado in 1887 and designed courthouses throughout the state. (Adams, Cheyenne, Washington, Summit, Saguache, Elber, Lincoln and Custer County courthouses.) Sterling contractors Kaepernik and Jenkins were selected to build the courthouse. Construction was completed in 1910. The white-pressed brick and white stone trimming cost approximately $100,000. On Saturday, March 5, 1910 it is estimated that 6,000 persons participated in the formal opening ceremony for the eloquent new structure. Emerson Warren, C. M. Morris and J. O. Shay were Commissioners at the time of the Courthouse construction. The building is an intact example of renaissance revival architecture with corner quoining, and simple cornice. The 2 1/2 story building with a full basement, blonde colored brick structure has while colored terra cotta detailing and a poured concrete foundation. The building's water table has one course of a red colored, St. Vrain foundation stone and seven courses of terra cotta on the builsing's base including water table coping. Decorative terra cotta quoining exists on each corner and also occurs around each entry door. Decorative window labels, lug sills, and chimney and dormer details are also terra cotta. The north, east, and west entry stairs to the first floor are stone with solid stone balustrades. Stairs to the basement ocur along the north and west elevations. On February 22, 1979, the Logan County Courthouse was placed on the National Register of Historic Places. Restoration of rotunda columns, decorative ceiling trim painting, woodwork, walls and floors. Every effort was made to utilize original colors and painting techniques. Original Fire Hoses were recovered and restored and hang in the rotunda of each floor. They are now for decorative purposes only. Replacement of the Stained Glass in the ceiling of the rotunda and installation of backlighting. The original stained glass was reportedly broken by a roll of roofing material falling through it during repair work many years ago. Placement of Eugene Carara Oil Paintings in the basement rotunda area. Individual paintings were purchased by private citizens and then donated to Logan County to keep the collection together. Each painting is symbolic of an historically important event or location to the people of northeastern Colorado. Duplication and placement of the original courthouse blueprints in the first and second floor rotunda areas. Donations in the amount of $17,600 aided in the restoration and a Sterling Founder’s Day celebration was held in the rotunda area of the Courthouse on November 10, 1984. 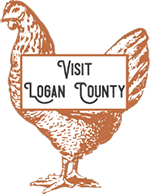 For further reading on Logan County History, recommended are: “A History of Logan County” by Emma Rose Conklin and “The Logan County Ledger” by Dale “Bud” Wells. In 1999 then County Commissioner James R. La Force, spearheaded efforts to obtain grants from the State Historical Fund and the Colorado Department of Local Affairs Energy Impact Assistance Fund to restore one of the finest Courthouses in Colorado. The first phase of this multi-phased plan was completed in 2005 and included the installation of an elevator in the southwest quadrant of the building which takes passengers from the basement up to the first and second floor areas. A secondary staircase was installed in the same area to allow for the removal of the unsightly exterior fire escape which finally was accomplished in Phase IV in September 2010. A new Logan County Justice Center was completed in September 2003 and the court functions of the county were moved to that facility. The Commissioners Office and staff and Finance Office took over the second floor space previously occupied by the court system. The remaining departments in the historic courthouse now have enough space to meet their needs. The building's electrical system has been completely upgraded to provide for today's technological requirements. The original steam radiators were replaced by individual heating and cooling units. This allowed for the removal of numerous unsightly window air conditioner units. Interior office spaces have been restored on all floors using historical paint color schemes. Original flooring was repaired and restored wherever possible. Windows and interior doors have been refinished and in some cases local craftsmen have replicated original doors, trim and counters that were removed in past remodeling efforts. Interior storm windows were installed providing for more efficient heating and cooling. Exterior brick, stone and concrete masonry restoration was repaired and the North, East and West porches were replaced due to excessive concrete deterioration. Windows and doors were refinished with the original paint finishes being replicated. Total spent on the restoration was $5,343,764.18 which included grants from History Colorado State Historical Fund in the amount of $1,511,874.92 and State of Colorado Impact Assistance Funds in the amount of $1,125,007.21.County matching funds spent over the ten year period amounted to $2,706,882.05. The last and final phase of restoration included the restoration of the courthouse dome to the original copper finish, replacement of the flag pole, roof and gutter repairs and remaining brick, stone and concrete masonry repairs. In 2013 a Flag Day Ceremony was held to commemorate the first flag flown over the courthouse in many decades. Congressman Cory Gardener's Office donated the flag which was one flown at the U.S. Capitol. The flag is now on display in the first floor display case.